Last week, I wrote about the much heralded Santa Claus Rally and last five trading days of the year. If you weren’t able to read the piece, I think it’s a good unbiased analysis debunking the notion that this time of year is like shooting fish in a barrel. With 2012, 2014, 2015 and 2016 all limping in to close the year, the trend has really been quite the opposite. So far in 2017, Santa has barely been seen with but one day left in the year. Now before you conclude that the bears have been in control lately, the Dow, S&P 500, S&P 400 and Russell 2000 have all basically gone sideways of late with the NASDAQ being the weakest index, down marginally. It still seems like the bulls should resolve this little range with an early 2018 upside breakout next week. Banks, transports and discretionary all look like they want to run higher into January while semis have really disappointed and have me questioning whether their leadership has ended for a while. High yields bonds, which have rallied of late, are still well below their Q4 all-time high peak. That’s my biggest domestic concern heading into 2018. However, the NYSE A/D Line continues to make all-time highs which should forestall any bear market or full fledged correction for the foreseeable future. Currencies have been unusually quiet for this time of year, but that’s one asset class where I see fireworks in 2018 as the massive capital flows into the US I have mentioned for years should finally come to fruition. At the same time, while commodities have rallied this quarter, I see that asset class as having much more upside potential with crude well on its way to my $100 target over the next few years. Here it is; the last five days of trading for 2017. So far, it’s been the least volatile year in history. And barring any truly unspeakable geopolitical event, it will end that way as well. The stock market hasn’t seen even a 5% decline, let alone any full fledged correction. Those most rewarded were the ones who did absolutely nothing all year, similar to 1995. I don’t think 2018 will be a repeat, but that’s a story for a different day. You may be hearing about the Santa Claus Rally (SCR) now. People define it all different ways or they just leave it nebulous so they can spin the result to fit their thesis. Yale Hirsch of Stock Trader’s Almanac fame (and a perennial must own book now written by his son Jeff) coined the phrase, “If Santa Claus fails to call, bears may come to Broad & Wall”. 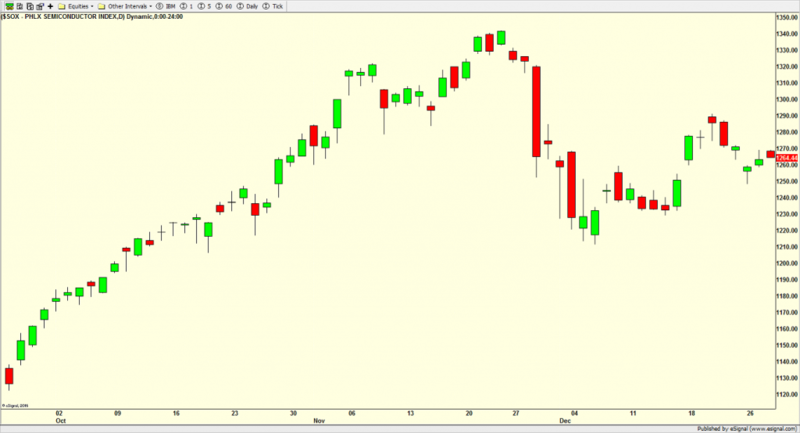 Research showed that if the last five trading days of the year and first two trading days of the New Year (Santa Claus rally) did not show a positive return, a bear market or significant correction was likely during the coming year. While that was certainly the case years ago, recent history since 2001 shows a significantly muted trend and I wonder if this trend has been fully diluted because of computerized trading, the proliferation of ETFs or even decimalization. Bears love to point out that Santa did not call in 1999 nor 2007 when two devastating bear markets were about to unfold. However, Santa also did not call in 1990, 1992, 1993 and 2004, yet no bear market or major correction ensued the following year. Santa also did not come in 2014, but I am sure proponents of this trend would point to the 15% summer decline as evidence that it “worked”. In 2015, Santa was a no show and stocks were in in the midst of a 15% correction which bottomed on January 20, 2016. How would they score that? Conversely, Santa called in 2010, but stocks saw a 20% decline in 2011. Santa came in 2000 and 2001, however 2001 and 2002 were awful bear market years. 1997 saw a big Santa Claus rally, yet 1998 had a 20% correction. The same can be said about 1989 and 1986. As stocks enter the final 5 days of 2017, most pundits have been spewing that it’s a “lay up” or “easy money” for stocks to continue higher into year-end because it’s “always” happens. The data do not support that, especially of late with 2016, 2015, 2014 and 2012 all down fractionally on the S&P 500. And let’s face it, stocks do look a little tired. The S&P 500 hasn’t closed above its opening price for more than a week. Monday picked up where Friday left off. Strong action in the major indices with the small caps following through from Friday’s burst higher. Even the European indices broke out to new highs. Emerging markets have not and are definitely looking tired. All four key sectors look good with the semis really trying to regain the top spot. High yield bonds, one of my favorite canaries in the coal mine, are the primary fly in the ointment as they cannot seem to get out of their own way lately. Having last seen new highs early in Q4, it looks like they are being held up by stocks and certainly not leading them. Until I see contagion, I won’t become too concerned but it is something to keep a close eye on. While I was channel surfing the business stations this morning, I couldn’t help but notice that every single pundit has suddenly become a long-term bull on stocks because of the tax bill. Time and time again, they were asked for their worst case scenarios and not a single one could come up with anything significant on the downside for the economy or stocks. That in of of itself is very, very dangerous group think! More on sentiment later. But WOW! On a final note, UCONN women’s basketball coach, Geno Auriemma goes for his 1000th victory tonight against Oklahoma in the Hall of Fame Holiday Classic. Let’s go Huskies! Friday saw much of the same stock market behavior as we have seen lately. The Dow, S&P 500 and NASDAQ 100 continue to act the best although after closing at a 10 day low with the aforementioned indices at new highs, the Russell 2000 finally got off the mat. The small cap index burst higher and it is now at least in a position to lead into January which would be fitting in well with historical norms. Over these final two weeks of 2017, I certainly would not be surprised to see the S&P 400 and Russell 2000 lead and see all-time highs, even at the expense of the other major indices. Friday also saw the semis, one of my key four sectors, begin to position itself for another run. Closing at a new high for December would confirm that move. Banks also look like they could be ready for another run higher. Couple that with strong action in the transports and discretionary and you have a market that just doesn’t want to give up any ground whatsoever. Any single day pullback is being bought and investors looking to use up some cash are being punished for waiting. While the media tries to play this up like the Dotcom era all over again, I do not agree at all. But that’s a topic for a different day. 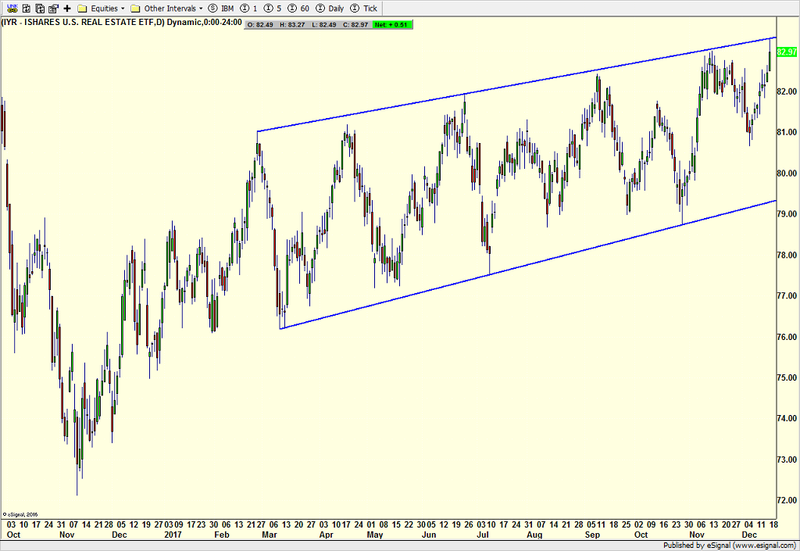 Below is a sector chart which I have been watching (and owning off and on for a while). Once again, REITs, real estate investment trusts, are at the top of a channel for the 5th time. Every other time, it has pulled back. Will this time see a change in behavior??? Finally, following up on our post FOMC (Fed) trend from last Wednesday, it closed out in the plus column as stocks were lower last Thursday, the only day the trend was active. As was expected by just about everyone, the Fed raised interest rates by .25% on Wednesday in their final meeting of 2017. This was far from their final rate hike of the cycle which is not good for the economy over the long-term. 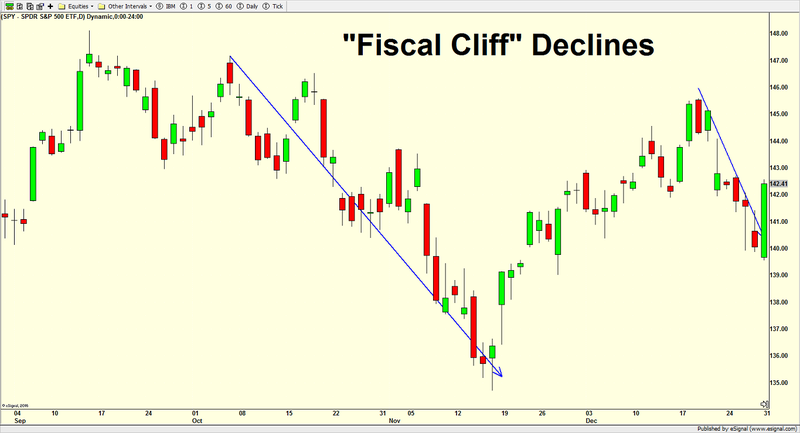 The stock market gave up much of the gains post FOMC and there were a few little cracks seen. The Dow remains the strongest index, not a good sign, while the Russell 2000 looks like it’s trying to step up and begin a run into year-end. It’s still a little early for that trend, but its behavior is mildly encouraging. Semis continue to act poorly after being so strong for so long. Surprising to me, the banks and financials had a dismal day which could lead to a little bout of weakness here. Discretionary and transports remained solid leaders. Both industrials and materials are also continuing to lead, a good sign for the economy. The dollar, however, fell hard. At the same time, both bonds and gold rallied which creates somewhat of a quandary. Are the defensive groups correct in sensing some economic weakness or are the economically sensitive sectors right and the economy will continue its winning ways. This is vaery unusual behavior for a Fed day. For the hear and now, any and all weakness should be bought until proven otherwise, something I feel like I have said 1000 times. Not that there are never declines this late in the year, but it’s very tough to get that selling snowball rolling downhill with any velocity. Sure, stocks could peak and decline 1-3% into year-end, but the odds favor a mild drift higher into the New Year. There’s just not many potential catalysts for a meaningful decline. I guess investors could use some of the soon to be released elements of tax reform as cause to sell, but then they would have to pay capital gains so soon. Finally, as I mentioned in the special update on Wednesday, there is a post FOMC trend which signals some short-term weakness starting today. It’s a little muted by strong seasonals, but it’s something we should be aware of. As with every Federal Open Market Committee (FOMC) statement day, there is a model for the stock market to follow pre and post announcement. Certain environments have very strong tendencies while others do not. Over the past few meetings, many of the strongest trends immediately before and after were muted except for a moderate post FOMC trend last meeting which called for mild weakness.The S&P 500 gained fractionally over that period. Today, as with most statement days, the first model calls for stocks to return plus or minus 0.50% until 2:00 PM. There is a 90% chance that occurs. If the stock market opens outside of that range, there is a strong trend to see stocks move in the opposite direction until 2:00 PM. For example, if the Dow opens down 1%, the model says to buy at the open and hold until at least 2:00 PM. The next model calls for stocks to close higher today and rally after 2:00 PM. That is usually a very strong trend, 80%+, however with the Dow sitting at all-time highs with barely a hiccup in four months, the bulls exhausted a lot of energy, similar to what we saw at the last two Fed meeting 6 and 12 weeks ago. That trend’s power has been muted significantly to less than 50% which is not exactly the kind of trend worth trading. Finally, assuming stocks close higher today, there is a trend setting up for a post statement day decline, although the seasonal strength of December puts a little damper on that. Janet Yellen & Company are certain to raise the Federal Funds Rate by .25% today. It’s the worst kept secret and the markets are fully prepared. I also expect an update on the Fed’s progress in trimming its $4 trillion balance sheet although I do not believe they will make any changes. All the Wrong Moves for Yellen & Co. Remember the Tom Cruise movie, “All the Right Moves”? It was a football movie set in steel country PA with Cruise having to make a number of life decisions. Well, if the Fed’s plan was a movie, I would title it “All the Wrong Moves”. Their academic arrogance has sprung up again and it will not end well for our economy. I want to stop for a moment and rehash an old, but still troubling theme. I am absolutely against the Fed hiking interest rates AND reducing the size of its balance sheet at the same time. It’s an unprecedented experiment and the Fed doesn’t have a good track record in this department. Pick one or the other. Stop worrying about ammunition for the next crisis. Given that the Fed has induced or accelerated almost every single recession of the modern era, I have no doubt that the recession coming in late 2018 or 2019 will certainly have the Fed’s fingerprints on it with their too tight monetary policy experiment. Let’s remember that the Fed was asleep at the wheel before the 1987 crash. In fact, Alan Greenspan, one of the worst Fed chairs of all-time, actually raised interest rates just before that fateful day. In 1998 before Russia defaulted on her debt and Long Term Capital almost took down the entire financial system, the Fed was raising rates again. Just after the Dotcom Bubble burst in March 2000, ole Alan started hiking rates in May 2000. And let’s not even go to 2007 where Ben Bernanke whom I view as one of the greats, proclaimed that there would be no contagion from the sub prime mortgage collapse. Yes. The Fed needs to stop. Below is a chart I have shown at least quarterly since 2008. With the exception of a brief period from mid 2009 to mid 2010, the velocity of money was, is and will continue collapsing. In the easiest terms, M2V measures how many times one unit of currency is turned over a period of time in the economy. As you can see, it’s been in a disastrous bear market since 1998 which just so happens to be the year where the Internet starting becoming a real force in the economy. Although it did uptick during the housing boom as rates went up, it turned out to be just a bounce before the collapse continued right to the present. This single chart definitely speaks to some structural problems in the financial system. Money is not getting turned over and desperately needs to. The economy has been suffering for many years and will not fully recover and function normally until money velocity rallies. Without this chart turning up, I do not believe the Fed will sustainable inflation at 2% or above. It would be interesting to see the impact if the Fed stopped paying banks for keeping reserves with the Fed. That could presumably force money out from the Fed and into loans or other performing assets. It continues to boggle my mind why no one calls the Fed out on this and certainly not Yellen at her quarterly press conference. Being her last presser today, let’s hope that someone in the media steps up! Fed Begins Meeting. But Bitcoin! The Federal Open Market Committee begins its final meeting of 2017 today. With the special election in Alabama and Bitcoin, does anyone really care about the Fed? For today, the stock market certainly doesn’t! With the Fed announcement that short-term interest rates are going up by .25% tomorrow at 2 pm, the market usually has a quiet day today with a slight edge to the bulls. More new closing highs in the Dow and S&P 500 but the same divergence in the S&P 400, Russell 2000 and NASDAQ 100. So much for the mild seasonal headwind so far. Of my four key sectors, only semis continue to concern me. The others remain strong. Most of the secondary sectors are behaving just fine as well. High yield bonds are lagging, but they are not rolling over, at least not yet. The NYSE A/D Line continues to score all-time highs. The bull market remains alive and reasonably well my broken record theme of buying any and all weakness remains in place. Another month, another strong employment report. 228,000, new jobs were added in November, stronger than expected, as the impact of the hurricanes continues to weaken. The unemployment rate remain at a 17 year low while wages grew at an annualized rate of 2.5%, still frustratingly short of where the Fed and government wants it to be. Thankfully, it’s still slightly ahead of the inflation rate. Every month it seems like the bears get all hyped up into this report with all kinds of negative forecasts, only to be disappointed time and time again. Don’t worry. At some point, they will be right and I fully expect them to crow how they got it right all along. As I have said all year, the theme of reality over rhetoric continues to be in play and accurate. If you get caught up in all the nonsense on Twitter and congressional infighting and North Korea, etc. you would think that things cannot be good. However, the economy is growing faster than it did in 2015 and 2016 and we all know what the stock market has done. The Dow and S&P 500 finished the week at new closing highs, but did not make new all-time highs. That won’t matter for more than a week or so, max. The other three indices performed fine and should see new highs this month. The only serious concern I have right now is that the semis have ceded leadership and are struggling. The market can continue higher with that group, but it makes it easier if they went along for the ride. We’re seeing really nice behavior from many other sectors. In the very short-term, there are two small headwinds to deal with. One continues to be that stocks have a very mild seasonally weak period for another week or so. Two is that rallies, especially to new highs on an employment report day often are signs of some short-term exhaustion. By that, I mean we could see a 1-3% soft patch, nothing really significant although with volatility at all-time lows, it would feel much worse than it is. The week ahead will be squarely focused on the Federal Reserve’s final meeting of 2017 with the expectation for another 1/4% rate hike. That meeting ends on Wednesday at 2:00 pm. More on that during the week. 2017 has been the year without volatility. Who would believe that stocks haven’t declined even 5% on a closing basis, let alone 10%. It’s crazy! And once the calendar gets to November, downside volatility becomes that much more difficult to see as potential catalysts for a decline go down significantly. Yes, of course, there is always that stray geopolitical event, like the infamous “Fiscal Cliff” in 2012 which I dubbed the equivalent of the Y2K hoax. The 2012 chart is below. 2017 has a potential government shutdown looming as well as some fairly fierce sector rotation as the proposed tax reform gets through Congress. I guess stocks could get a tiny bit cranky if the House and Senate cannot successfully get the bill out of conference this month. I just cannot believe there will be a December government shutdown. Much more importantly, we have seen a rush into the banks, discretionary, homebuilders, industrials and transports at the expense of technology, utilities and REITs. This is exactly what we saw after Trump won, but so far, on a much smaller scale. Interestingly, this time around, bonds are not plunging like they did 13 months ago. Remember, stocks have a bit of a seasonal headwind for another week or two. We saw wild action on Friday with the erroneous Flynn announcement and then the largest downside reversal since 2000 on Monday, according to sentimentrader.com. Rather than show my usual daily chart, below is a 15 minute chart so you can see just how volatile the action has been. In the end, the bull market isn’t over. This rally isn’t over. A small dose of vol is here. Semis ceded their leadership position, but banks, discretionary and transports have stepped up. We just need to see high yield bonds score new highs to further insulate stocks from a correction. Can Flynn End the Bull Market? One month to go in 2017. Lots and lots of underinvested people chasing returns now. What the heck do they do? Especially when pullbacks have been few and far between. We haven’t seen a 10% decline since February 2016. There have been no pullbacks of 5-10% at all since then. The biggest decline we have seen was in Q3/Q4 2016 and that was 4.63% in the S&P 500. Hardly what people have been waiting for to invest their cash and that was under Dow 18,000. This morning, news broke that Michael Flynn pleaded guilty to lying to the FBI and is prepared to cooperate with the Mueller investigation. Immediately, stocks and the dollar plunged while bonds and gold rallied. As Mike Pence supporters are readying President Pence, the bears are hoping that this is the big one. The end of the “Trump Trade”. Phooey I say! The bull market isn’t over. Seasonally, there is a soft patch from today through December 15. That means that historically, stocks have a headwind for the next two weeks, not that they have to plunge. Countering that is that stocks just closed the month at their highest level of the month. Historically, that has led to strong upside over the next week roughly 70% of the time. Stocks have been uber strong for a long, long time. 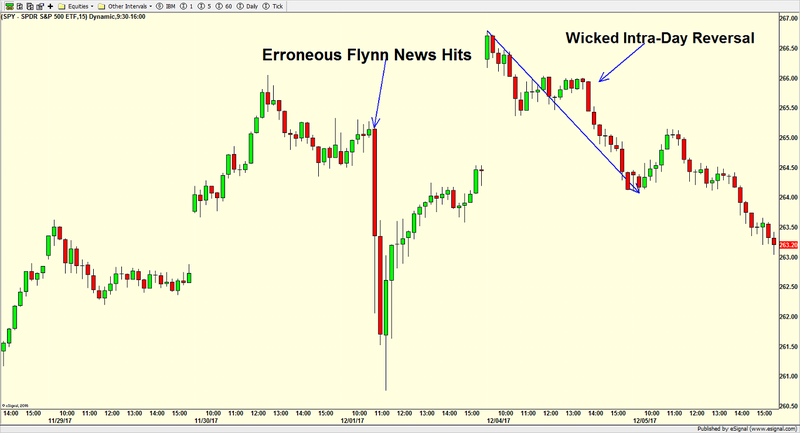 The Flynn news will increase volatility and give a little downside nudge to the market. However, tax reform will still pass. Corporate earnings are setting records. The economy is getting stronger quarter by quarter. Buy any and all weakness until proven otherwise. Donald Trump didn’t create the bull market or feed it. The credit goes to the GOP.